For those who have this question, this is not that other Gretchen Rau; the one with the Academy Award for Art Direction and the seemingly fabulous/productive/artistic life who died tragically in 2006 of a brain tumor. It’s weird enough living in the United States with the name Gretchen. The additional condition of sharing the combination Gretchen+Rau with a famous artist means that this Gretchen Rau will forever be found 20 pages deep in any Google search. But more than that, sharing the name creates an odd but welcome affinity. May she be happy, wherever she is. This is also not that other Gretchen Rau; the one who paints fine art pastels of the American West. Perhaps I’ve missed the calling that came with the bestowing of my name? 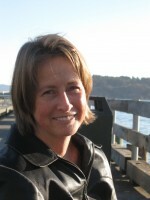 This Gretchen Rau lives in San Francisco in a Buddhist temple where she has engaged in meditation and ceremonial practice with about 65 other practitioners since May 2009. She works full-time “outside” of the temple for a nonprofit organization that works to prevent dangerous climate change. Is there something you want to hear more about? Write to Gretchen here.